5.0 out of 5 stars"A Man out of Time"
I have been very pleased by the parade to print of Dr Who celebrity biographies such as; Terry nation, Robert Holmes, JNT and welcome reprints of Pertwee and Hartnell biographies. The good news is this is set to continue with producer/writer Derrick's Sherwin's book announced and (according to the intro for this book) a Malcom Hulke bio on the way.. This is very different to the Nation and Holmes books because it does not trace Pedler's life through his writing alone, it would not have done justice to him. We follow his writing, work in science, campaigning on environmental issues and resultant changes in his own life plus his personal life. Seeley does not portray a saint but as can often be the case a man of high ideals who had difficulties in his personal life-infidelity and affairs. His children and 1st wife all admit he could be a little vainglorious and did not always like being argued with (1st wife Una believes he coveted a Nobel Prize) but was a loving family man who wanted his family to read his "the Quest for Gaia" perhaps even more than colleagues etc. His family history seems to have naturally led him to a career in science. the early days saw him working happily in research but even then wondering if this was all there was. Seeley cleverly feeds in quotes & passages from Quest for gaia where he looked back on these early days. Science shows how his views changed e.g. in work on the retina (his idea that retinas contain some brain material proved controversial) he conducted animal experiments. Brace yourself if you love cats as much as me, they were on kittens! In later years he campaigned against such experiments when he felt they were not productive, caused unnecessary suffering and were research for its own sake. e.g. he believed making animals smoke 30 cigarettes made from a "safer" tobacco substitute was useless because smoke will damage lungs in all cases. He became a maverick scientist concerned over where the individual fitted into the large numbers involved in research and progress, a little like (no I can't resist saying it) the timelord he would write about. The famous meeting with Gerry Davis led of course to one of the most popular Who monsters and a successful writing partnership. The part of the book that may be of the greatest interest, his Dr Who work is very good. While it gives no proper insight into the day to day collaborations between the pair, all 3 of their co-authored Cyberman scripts are examined in detail. Seeley contends that the original plans that the inhabitants of Mondas in "the Tenth Planet" be "Star Monks" or "vampires" led to ideas that were used even when the aliens were changed into the Cybermen. E.G. they preach and convert or like vampires turn you into them and there is a certain amount of coffin iconography. Of the stories that Pedler storylined alone, Seeley could find little detail for "Wheel in Space" or "The Invasion" but did uncover that "The War macines" would originally have had a human shape-perhaps working toward the later Cybermen? He also provides the original end for "Tenth Planet" before it became the changeover story from Hartnell to Troughton. There appear to have been no fallings out that led to him leaving Dr Who, in fact he later cut a clipping showing new Dr Tom Baker posing with a Cyberman. He also invited the Tomster to a bonfire party. It seems likely that the break from Who was to create "Doomwatch" with Davis. Closer to Pedler's heart this featured a team of scientists invetsigating dangerous scientific devices and processes. It was Pedler's wish a real Doomwatch be set up and he campaigned to make it happen for some time. The story of Doomwatch is bittersweet as following a successful 1st season, increasing differences with producer Terence Dudley led to Pedler and Davis leaving and in the eyes of many the show's fall. he did become known as "Dr Doom" on the strength of it & was often invited to comment on investigate scientific mysteries etc. He became attracted to the idea of Gaia , an idea that the universe is a single living organism we are all a part of and it led to one of the works he was most proud of "The Quest of Gaia" It's tempting to see this as his life's climax but it's really only the end of phase 1 as following Gaia he went on to campaign on many issues including notably nuclear power. Worried about the use of plutonium he built his own (non-working) nuclear bomb to prove how dangerously easy it was! While not everything he said has turned out to be right, a significant number of things he championed have been revisited e.g. wind turbines, the overuse of antibiotics leanding to weakened resistance to infection. He was very much the real deal re-designing the way he lived to be more energy efficient e.g. gathering energy from kitchen waste, building his own environmentally friendly wooden car and turning his back on eating meat and bathing as vegetarianism and showers wasted less energy. Toward the end of his life he was working on the idea of a self sufficient village which would be like Epcot only on a much grander scale and for people to live in and not just visit. It's a great shame he was never a guest at a Dr Who convention where he might have provided anecdotes about 60's Who in exchange for a chance to share his ideas with a new audience. He remains a product of his time and also a man ahead of his time who would look back to earlier periods e.g. to see a thousand year old wind turbine design better than the near lethal ones he designed himself. The book ends on selected writings, the best of which is Pedler and Davis's script for the lost from the archives Doomwatch story "Survival Code"
Seeley's research is 1st rate and his style good. I found the scientific stuff a little dry but then I'm not very scientific. 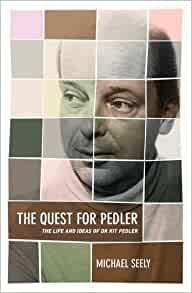 5.0 out of 5 starsA truly fascinating biography; Pedler lives again therein! An extremely well-researched and readable book. A biography of a man who died 35 years ago but whose name is still remembered and his presence missed, not only by science enthusiasts, but by environmentalists and by science fiction devotees. You NEED this book. Not only because it's the fascinating life history of a man you would do well to choose as an inspiration and as a role model, but because the author includes scripts and extracts from the man's work and you can get even closer to Dr Pedler and his ideas by studying them at your own pace.